One of the most frequent questions we get is “How can I control all of the small oak sprouts that are coming up under my live oak tree?” This can be a very frustrating situation for those who are attempting to make flower beds, plant ground cover or other ornamental plants, or just trying to enjoy their lawn by frolicking barefooted through the grass. First an explanation about how these sprouts come about is required. One of the basic, and most successful, methods of mother nature’s propagation of the live oak are these root sprouts. In their native environment single live oak trees are seldom found. Rather they are congregated in groups of trees called copses. Perhaps a squirrel planted the original acorn from which this copse emerged and the ensuing tree sent up many oak sprouts. Of that many some succumbed to the browsing of domestic and wild animals such as cattle and deer which find them very tasty, and some didn’t make it for other reasons. Those that survived became the copse, all connected to a common root system. It is this common root system that makes the fungal disease, oak wilt, so devastating as when one of the trees is infected all of the trees in that copse become infected as the fungus progresses through the root system. Since those root sprouts are growing from the roots of the tree(s) they are under or near, any attempt to kill them with herbicides is going to be detrimental to the health of the mother tree. You can dig them out by grubbing the entire area under the tree, but this is just a very temporary solution as they are going to come back with a vengeance. So really the answer is that we just have to learn to live with them. How you do this is a personal preference. 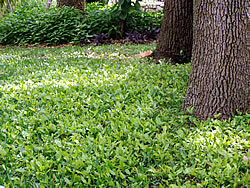 Some plant Asian Jasmine in the same area because of its similar leaf appearance and periodically cut off the oak sprouts as they grow taller than the ground cover. Some thin out the canopy of the trees, allowing more sunlight to filter down to the ground enabling St. Augustine or Zoysia grass to grow. Then the offending oak sprouts growing in the grass are frequently mowed off. 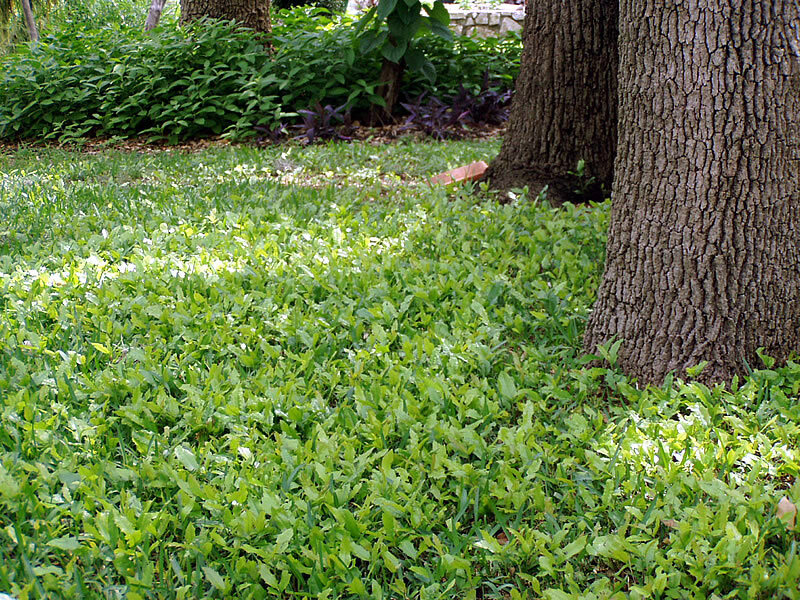 I have also seen them used as a ground cover just by keeping them mowed. Your next question is going to be “Why are they under some trees and not others?” I do not have an answer to this. Research continues in the attempt to find an answer to this question so maybe someday we will know. Lastly, I remember a tongue-in-cheek answer given by a noted local horticulturist whose recommended solution was “to get a goat”. This seems to work with deer also if they have access to these sprouts.